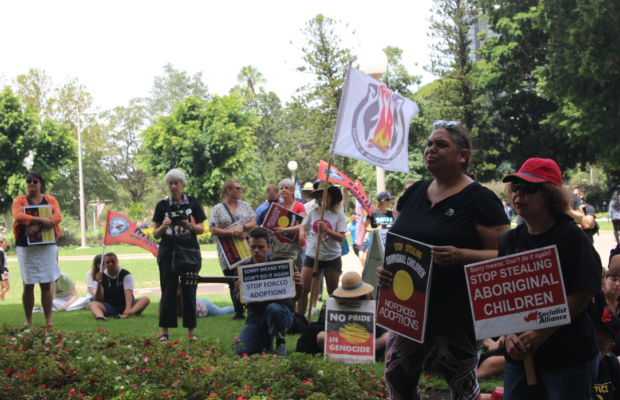 Hundreds of protesters rallied this afternoon against forced adoption laws allowing the ongoing removal of Indigenous children that were passed in November last year. 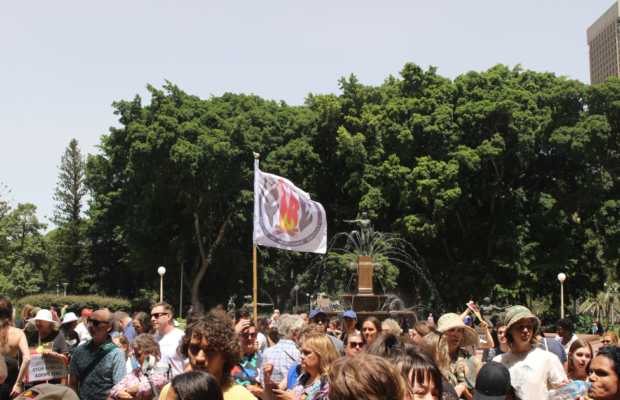 Approximately 400 people gathered at Hyde Park Fountain to attend the rally that had been organised by Grandmothers Against Removals on the eleventh anniversary of Kevin Rudd’s 2008 apology to the Stolen Generations. The rally’s focal point was the forced adoption laws that were passed in the NSW Parliament by the Berejiklian Government in November 2018 which allows children to be removed from their families without their parents’ consent. Almost 40% of children in out-of-home care are Indigenous, meaning that these laws disproportionately impact Indigenous families. The laws prevent children from being returned to their families after a period of only two years in out of home care. Hazel Collins, one of the founders of Grandmothers Against Removals, also spoke. “Our children are our future. One day regardless of race, we will be the ancestral footprint and one thing that our children need to know is that we fought to bring them home,” she said. “Over the years I’ve watched my brothers and sisters come back to my home family never to be reconnected. We loved each other as a family but the family structure has been broken,” he said. Protesters hold placards in Hyde Park. Photo: Annie Zhang. The government currently spends $1.2 billion operating out-of-home care services and placing children in these services. One sixth of that is spent on support networks to keep families together and strengthen communities. “Parliament House last November forced the adoption bill which was shamelessly rushed through and became law. We’re demanding that these laws be repealed,” Wright said. While the government claims to have taken submissions from the sector regarding the legislation, these have never been made public. A FIRE flag flies over the rally at Hyde Park Fountain. Photo: Annie Zhang. “If elected we will repeal this legislation within 100 days,” she said. Aboriginal and Torres Strait Islander Social Justice Commissioner, June Oscar, spoke to the resilience of the Indigenous community. “We’re black women and we don’t give up, and we’re strong.” Oscar is a strong advocate for Indigenous Australian languages and social justice. “If these statistics weren’t enough to make us take a step back, the fact that the NSW Parliament passed fresh laws in November 2018 that most of its critics say will cause another stolen generation should be,” he said. 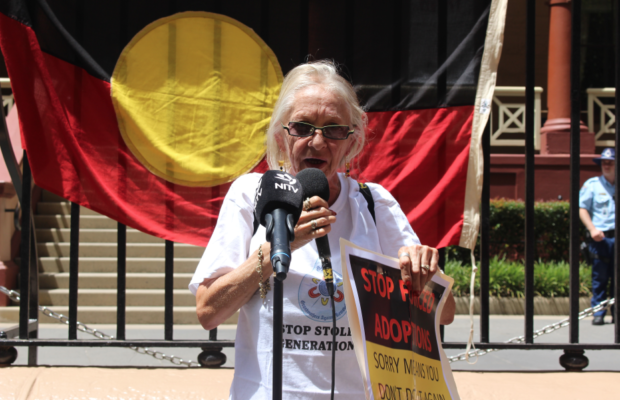 The speakers then led a march towards NSW Parliament down Macquarie Street, a street named after historical figure Governor Lachlan Macquarie, who had historically forced the adoption of thousands of children who would become the Stolen Generation. Protesters marched passed the Law Courts and the Reserve Bank of Australia. Hazel Collins speaks to the rally in front of NSW Parliament. Photo: Annie Zhang. “Till the day I die, till the last baby is brought home, I’ll be out here and I’ll be holding the government accountable,” she said. Another rally is taking place tomorrow to commemorate the killing of TJ Hickey in 2004. Protesters will meet TJ Hickey Park in Waterloo from 10am to 2pm, hosted by the Indigenous Social Justice Association.